CCNA (Cisco Certified Network Associate) is the entry-level certification offered by Cisco Company. It is the popular IT certifications in the hardware and networking field around the world. It was 1st introduced in 1998. In network Industry, most of the employers are expected to have Cisco CCNA Certification. A Professional can learn and understand how to install, configure, operate and troubleshoot routers and switches in networks. Why KaaShiv InfoTech Company to learn CCNA Training in Chennai? 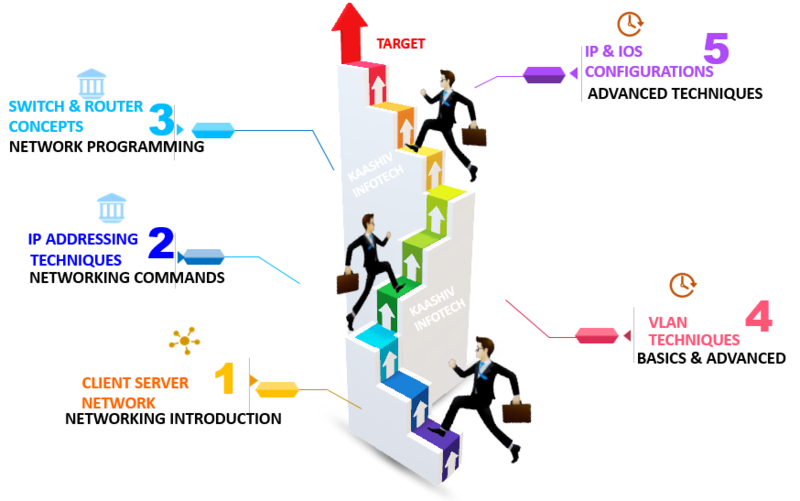 Kaashiv provides Best CCNA Training in Chennai with professional trainers who provide real-time training and also projects to the candidates for better understanding. Why Students Enroll for real time CCNA Training in Chennai ? Kaashiv provides CCNA training in Chennai will train students to install, operate, configure and verify IPv4 and IPv6 networks and with LAN switch, connecting to a WAN and configure IP router. Our trained professionals will train your skills in hardware and networking concepts with real-time practical sessions and get expertise in the network field. Learn and Implement 120 Concepts Covering Networking Technologies. Industry recognized Course Completion Certificate + Digital Marketing Certificate + (Achievement certificate for best performers) will be given to the students. Students undergone CCNA training will be expertise in Networking / CCNA degree, Complete networking, LAN connection for the office, Switch configurations, Router configurations. For CCNA Training 120 concepts from Basic to Advanced will be covered.